"Dr. Goldstein's book gives us a fascinating glimpse into what it meant to be a medical student participant in the forensic investigation of the World Trade Center disaster, the largest mass murder in the history of the United States." 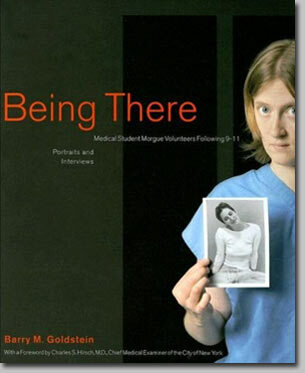 "Each student related their experience to Professor of Medicine Barry M. Goldstein, who also photographed the volunteer students posing with a person or item that anchored them during their time at the morgue...The difficulty of their experiencse comes through in the stark honesty of the transcribed interviews, but it is the images that convey the unbelievable weight of the events on these lives. The intense gazes returned by these young people���most in their mid-twenties���show souls made older by witnessing tragedy firsthand." All images and text copyright Barry Goldstein © 2013. Website Credits.